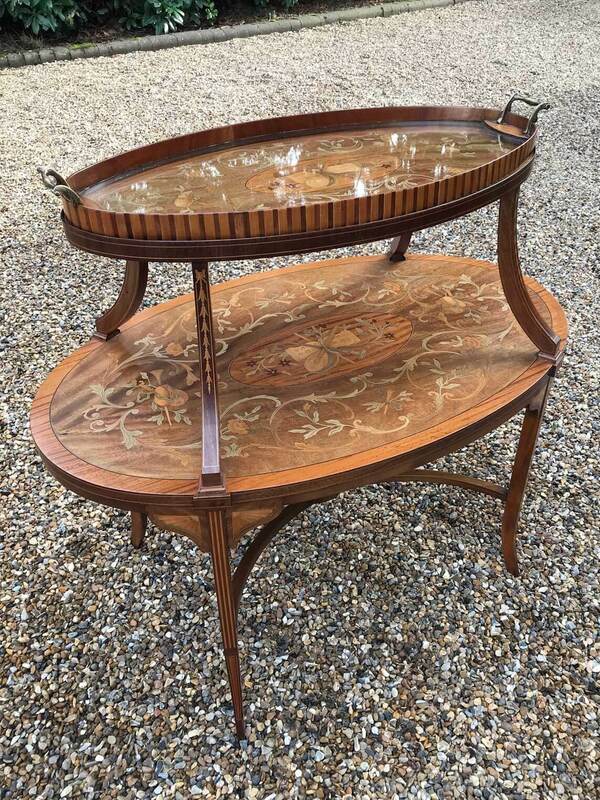 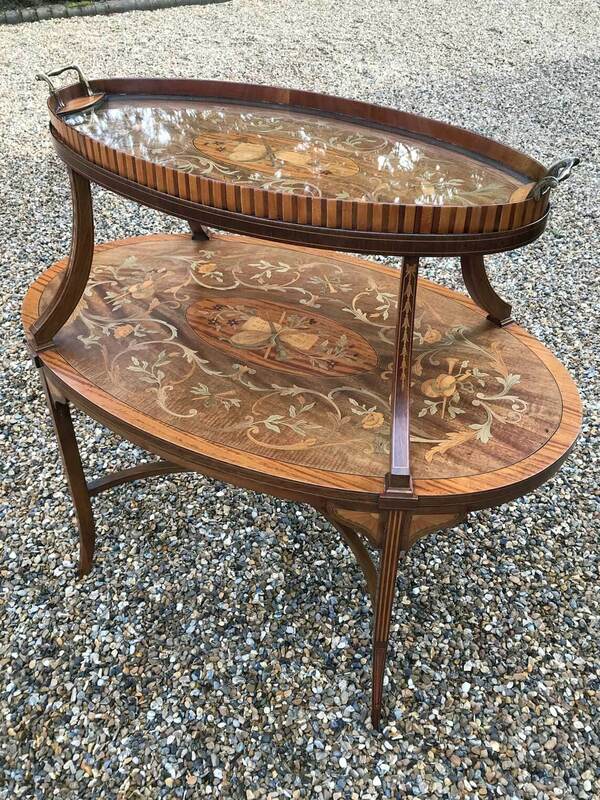 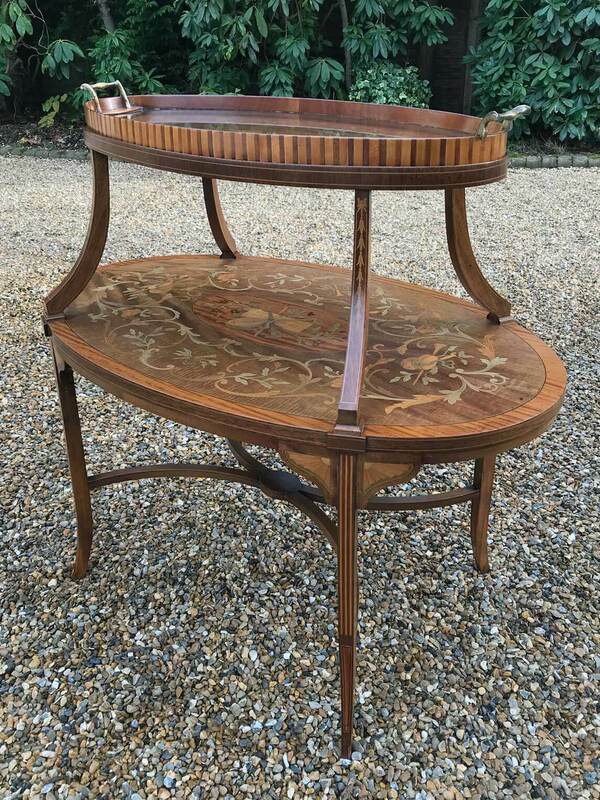 A very high quality English 19th Century Mahogany and Satinwood Marquetry Oval Two Tier Tray Etagere Table by London cabinet makers, S & H Jewell, London. 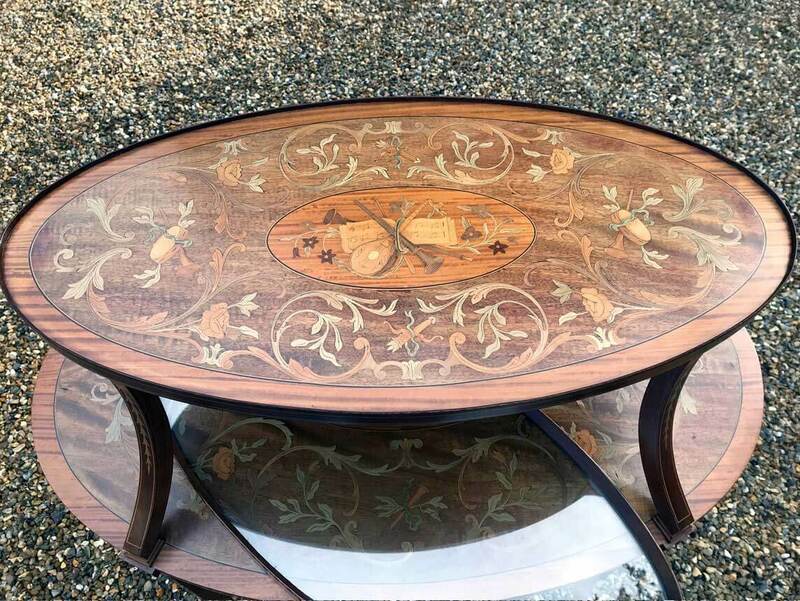 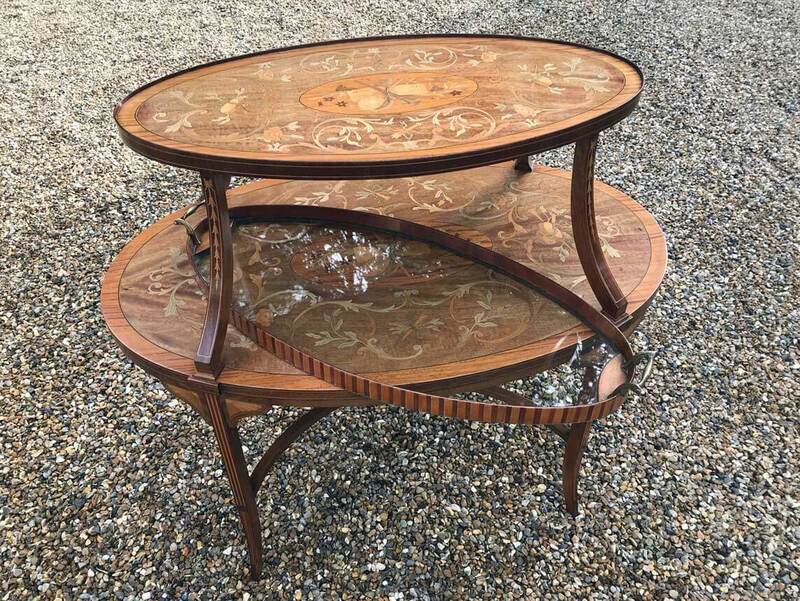 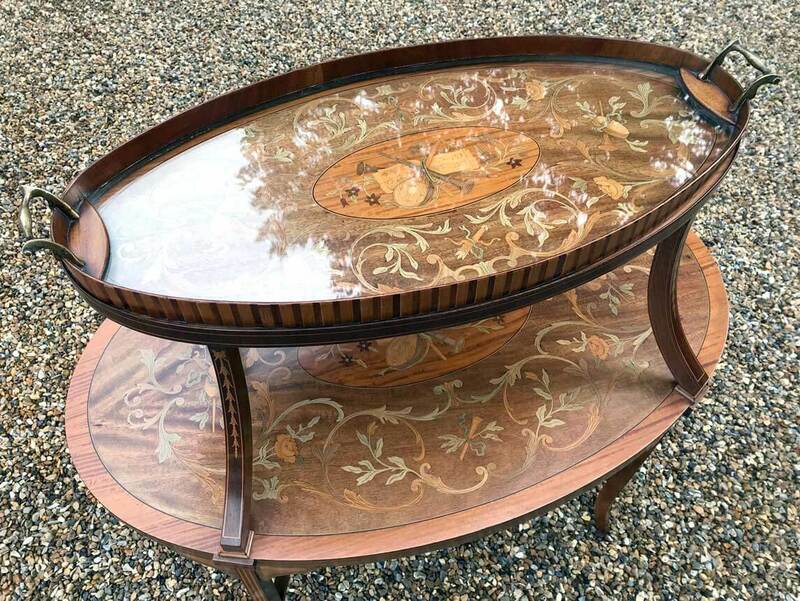 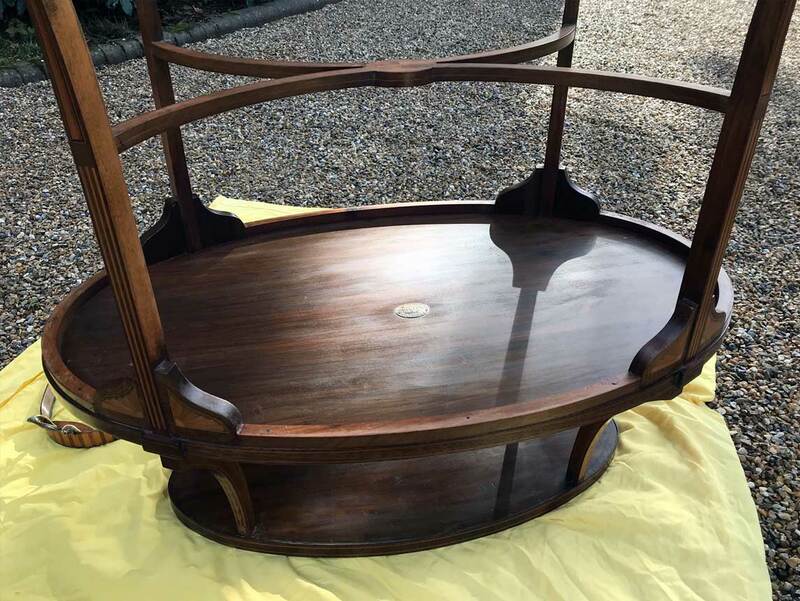 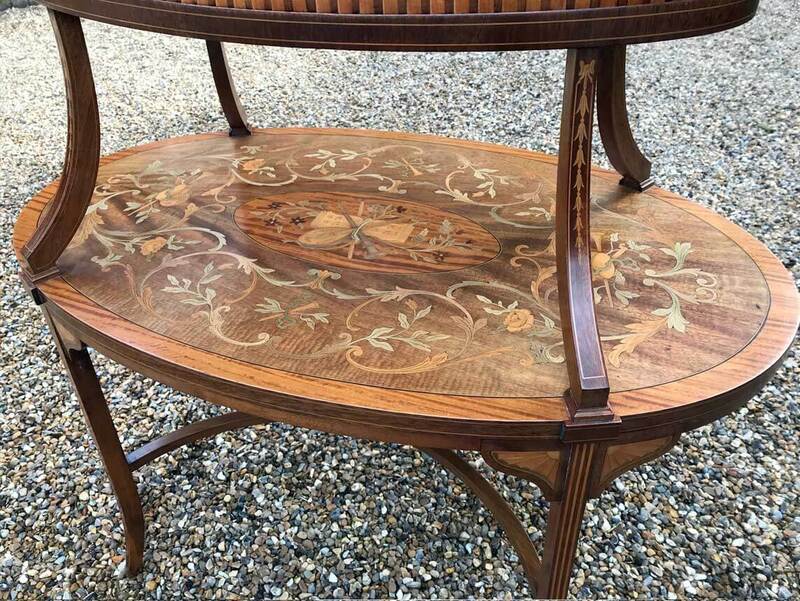 This table consists of two oval tiers, both with a central oval mahogany panel inlaid with musical instruments and floral decoration with satinwood, ebony and boxwood stringing. 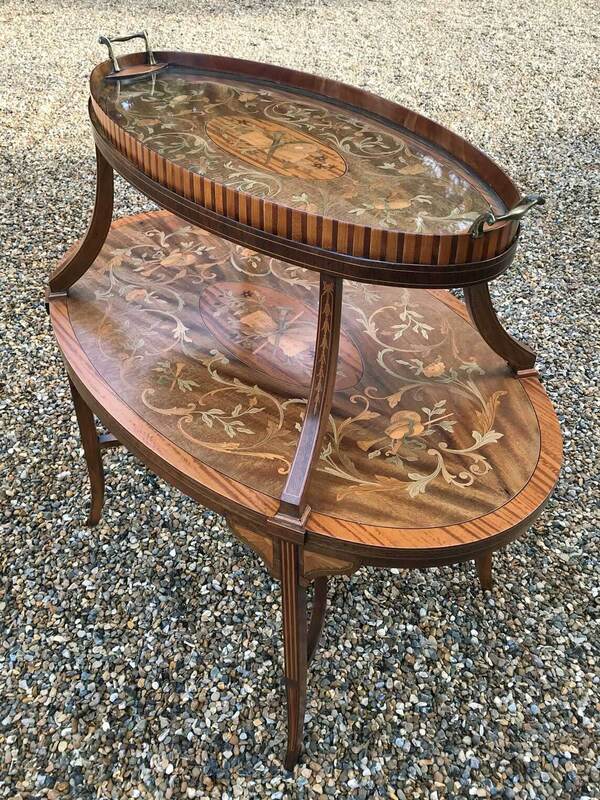 This is surrounded by a finely figured satinwood veneered panel profusely and finely inlaid with stained marquetry floral and foliate decoration with intertwined musical instruments surrounded by ebony and boxwood stringing with an outer mahogany banding leading to satinwood and ebony stringing to the edge. 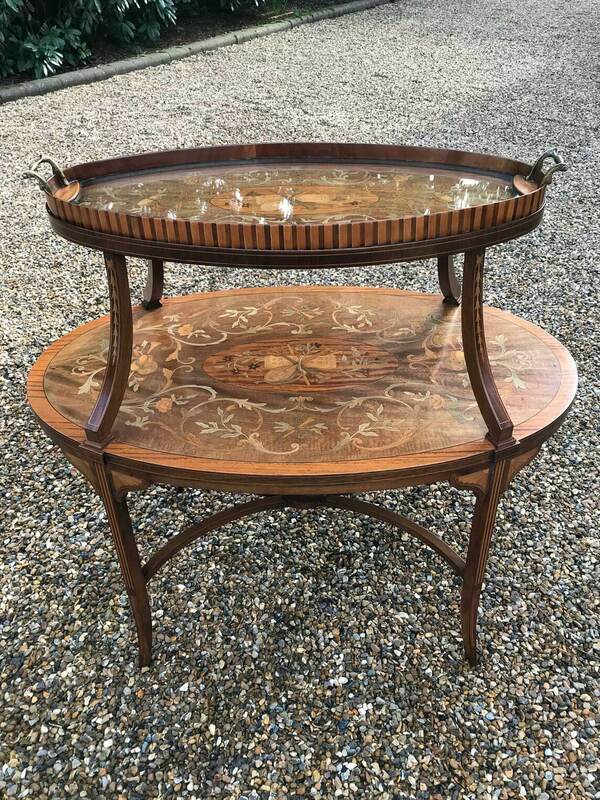 The removable glass bottomed tray fits perfectly into the top tier with original brass handles and decorative inlaid banding round the edge. 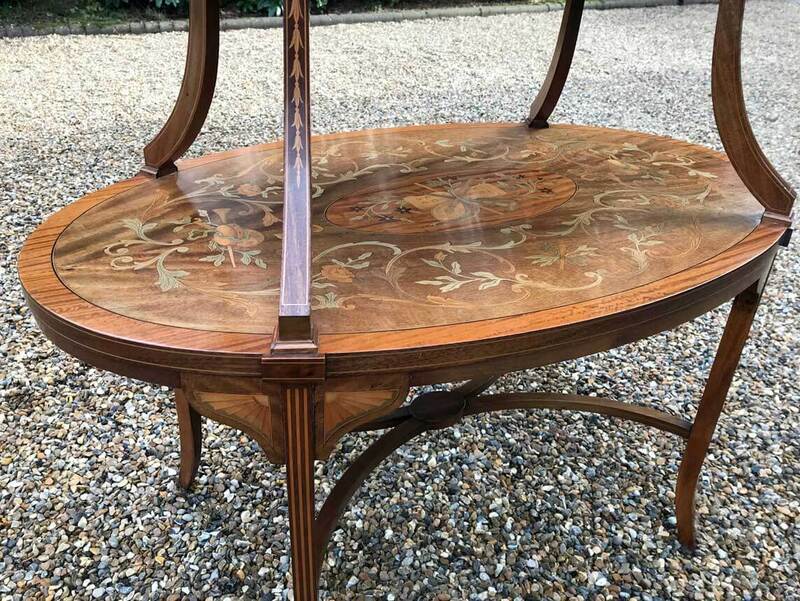 The table is supported by four tapering outswept mahogany legs with inlaid decoration, the top of the legs having inlaid fan spandrels. 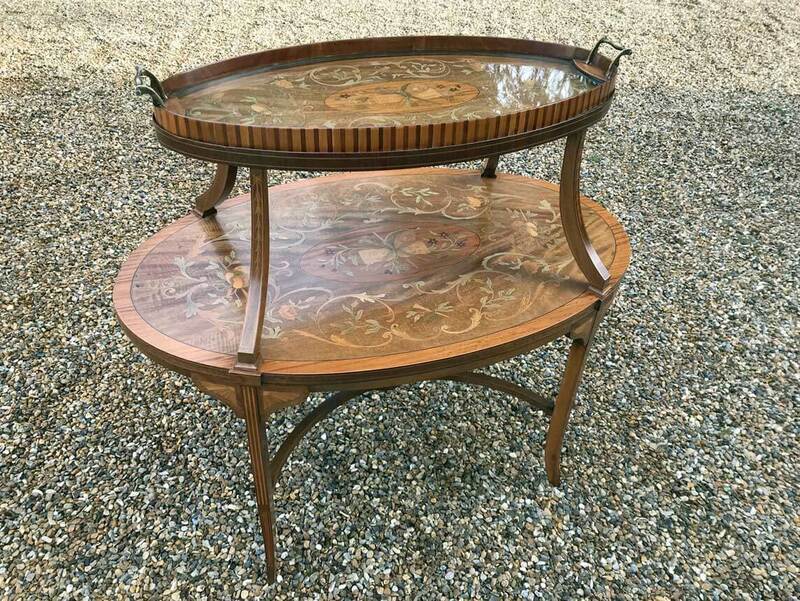 The four legs support an oval shelf also having identical finely inlaid decoration as the top. 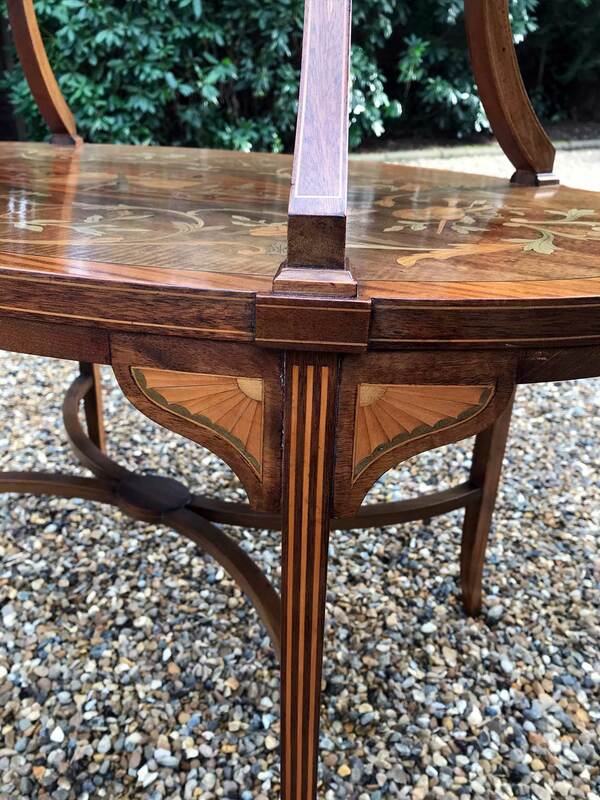 The table retains retailer plaque ‘S & H Jewel, Little Queen, Holborn’ to the underside. 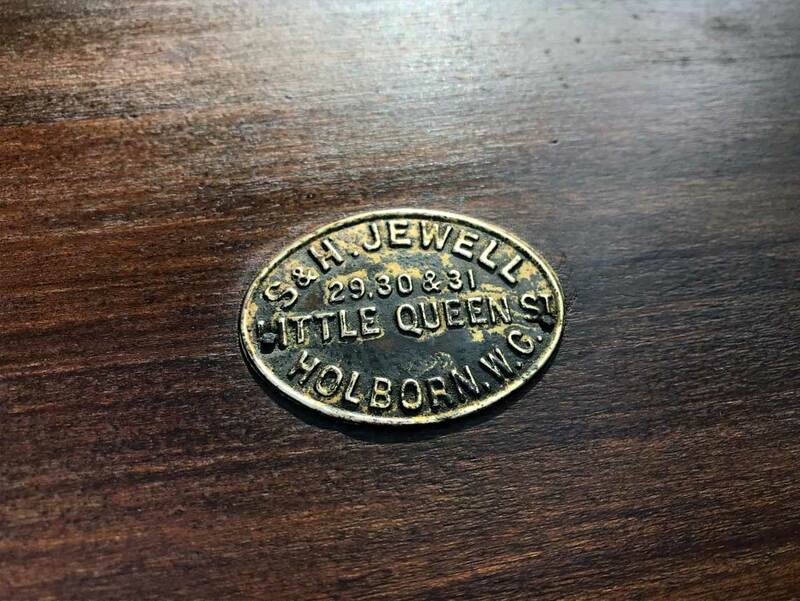 ‘S&H Jewel, Little Queen Street, Holborn’ were based in London and were recorded as quality cabinet-markers from 1830-1894.